The FBI debunked the Majestic 12 UFO documents in the most childish way possible. 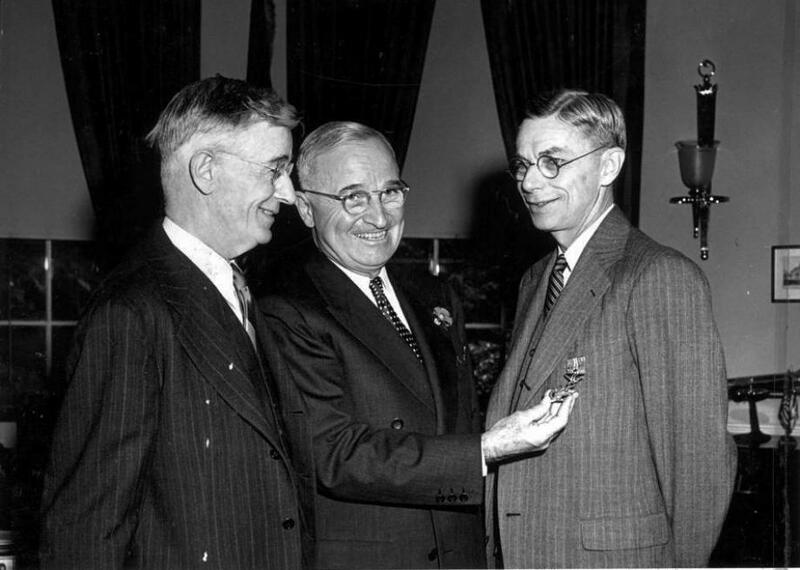 Vannevar Bush with President Truman and atomic scientist James Conant. Everyone knows the story of the alien craft that supposedly crashed in Roswell, New Mexico, in 1947, but who was appointed to deal with it? According to UFOlogy diehards, it was a group known as the Majestic 12, and there are top-secret documents to prove it. The FBI says the whole story is “bogus.” Yes, that’s a quote. It wrote “BOGUS” across the documents. The relevant files can be easily accessed on the FBI’s website, and nothing in there has been redacted. But no matter how many times the Majestic 12 case gets debunked, true believers stay interested. Mark Fenster, author of Conspiracy Theories: Secrecy and Power in American Culture, has done extensive research into modern-day conspiracy theories, including those surrounding 9/11. He points out that the enduring appeal of the Majestic 12 has to do with the government’s response. “If you wanted to bluff as the FBI, you would redact nothing,” he says. To believers, the story of the Majestic 12 (also known as the MJ-12 or MAJIC) goes back to 1947, but as far as supposed hard evidence is concerned, it begins in 1984. Documentary producer Jaime Shandera is said to have been reading a magazine at home when a mysterious envelope was dropped through his mail slot. The envelope, which bore a New Mexico postmark, contained a roll of undeveloped photo film. Not a UFOlogist himself, Shandera supposedly took the mysterious film with him to dinner with friend and avid conspiracy theorist William Moore. Once Moore heard Shandera’s strange tale, he apparently ditched dinner and went to his house to develop the images. The pictures were not of people or places (or aliens) but of eight pages of classified documents. While they weren’t exactly the candid shots of an alien autopsy that Shandera and Moore had likely hoped for, the top-secret pages told an explosive story that, if true, not only confirmed the Roswell incidentbut also detailed the people behind its research and cover-up. The most prominent file, dated 1952, described a number of UFO encounters, including the Roswell crash, from 1947 on into the 1950s. While these descriptions all seem vague enough to be easily dismissed, the real gold in the document was the revelation that President Truman had appointed a committee of scientists, government officials, and military men—the Majestic 12—to figure out just how to deal with the Roswell crash and any other alien incursions that might occur in the future. These were the original men in black. According to the documents, members of the original MJ-12 included Dr. Vannevar Bush, an inventor, engineer, and head of the U.S. Office of Scientific Research and Development during World War II; Retired Admiral Sidney Souers, the first director of the CIA; and Dr. Donald Menzel, theoretical astrophysicist and avid UFO debunker. Shandera and Moore would spend years trying to verify and validate the documents that had fallen into their laps, while word of the Majestic 12 spread among UFOlogists and believers. The existence of a secret government cabal working to hide and control our first contact with extraterrestrials was just too juicy to stay buried. The documents’ claims began to take hold, both in the UFOlogy community and in the larger culture it touched, worming its way into the standard alien conspiracy narrative. But the seemingly incriminating documents didn’t hold water for long. Prominent members of the UFOlogy community, like skeptic Philip Klass, began to point out flaws and inconsistencies in the allegedly top-secret papers. Among the many issues that have been raised regarding the Majestic 12 documents are some incorrect ranks assigned to the members of the group, odd formatting that didn’t match with standard government briefs of their vintage, and some anachronistic verbiage, specifically the use of the term media as opposed to the term press. The most damning issue with the Majestic 12 documents was their origin. None other than Carl Sagan himself denounced the documents in his book The Demon Haunted World: Science As A Candle In The Dark. “Where the MJ-12 documents are most vulnerable and suspect is exactly on this question of provenance—the evidence miraculously dropped on a doorstep like something out of a fairy story, perhaps ‘The Shoemaker and the Elves,’ ” he wrote. Moore soon became the presumed perpetrator of a hoax. As the central figure behind the dissemination of the documents, it was assumed that he had simply had them forged. By the late 1980s, the FBI and the Air Force had gotten wind of the Majestic 12 documents and launched investigations into their veracity, mainly trying to determine whether someone was disseminating classified documents. The Air Force Office of Special Investigations looked into the matter before handing it over to the FBI around 1988. Their investigators were able to determine that the pages were bunk. 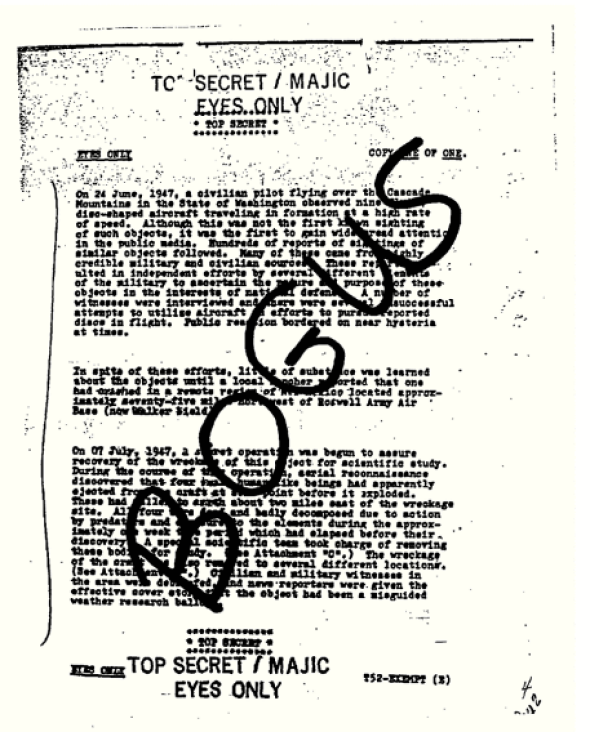 In its final assessment on the Majestic 12 documents, an FBI official wrote, “The document is completely bogus.” To drive the point home, the word “bogus” was then scrawled across the filed documents in giant capital letters. Still, the Majestic 12 live on. There are those in the UFOlogy community, such as prominent voice Stanton Friedman, who still believe that the documents are real and continue to argue the point. There have even been further documents that have surfaced claiming to support the originals, but none have gained such a strong response. In a more broad sense, the Majestic 12 seem to be thoroughly ingrained into the larger UFO narrative at this point, appearing in some form or another in shows like The X-Files (as the Syndicate) and movies like Men in Black (as, you know … the Men in Black). Even if the truth isn’t in the Majestic 12 documents, some people still seem to want to believe.